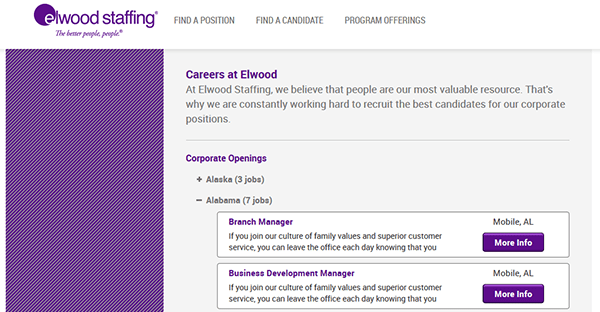 The Elwood Staffing job application can be found on the company’s main employment site. Use the links/buttons provided on this page to go directly to the company’s careers page. Once you’re on the careers page you will be able to search the list of current openings, create a job portal account, and submit applications for positions that you are interested in. The guide posted below provides a general overview of the company’s online application process. About the Company: Elwood Staffing is an American professional staffing services company based out of Columbus, Indiana. The company was formed in 1980, and has more than 150 locations. More than 900 people are employed by Elwood Staffing.